Dr. Michael Vitka lectures on a model of a doll associated with witchcraft during a tour of allegedly haunted locations in Salem. SALEM — It had been a while since I truly indulged my interest in the weird. Growing up watching “Twilight Zone” re-runs and transfixed by the strange and lovely words of science fiction writer H.P. Lovecraft, I developed an abiding affection for the absurd. So ever since an assignment in June briefly took me to Salem, the infamous home of the 1692 witch trials, I wanted to go back. Last week, thanks to the Globe’s summer tourism series, I got my chance. To rekindle my love of the strange, and promised online the experience would be “historically accurate as well as truly frightening,” I booked a Spellbound “Voodoo, Vampires, and Ghosts” tour for $16. 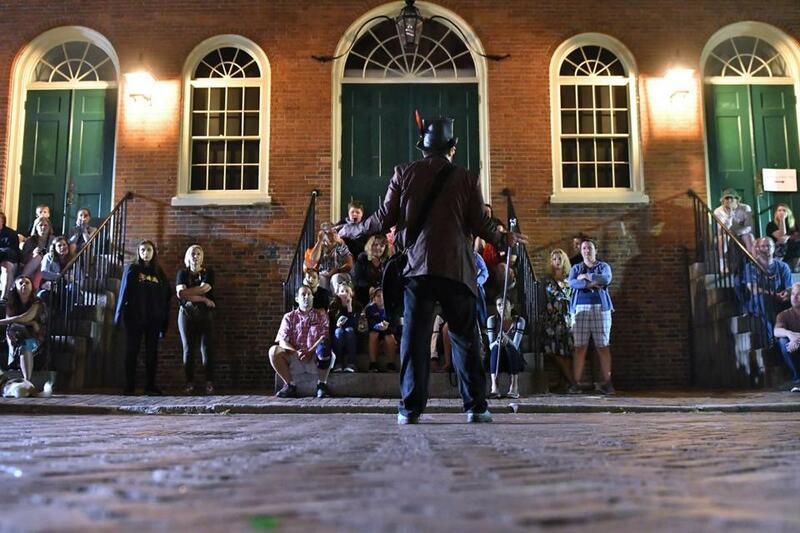 More than 1 million people visit Salem each year, many of them drawn by the dark history of the witch trials, which sent 20 people to their deaths. 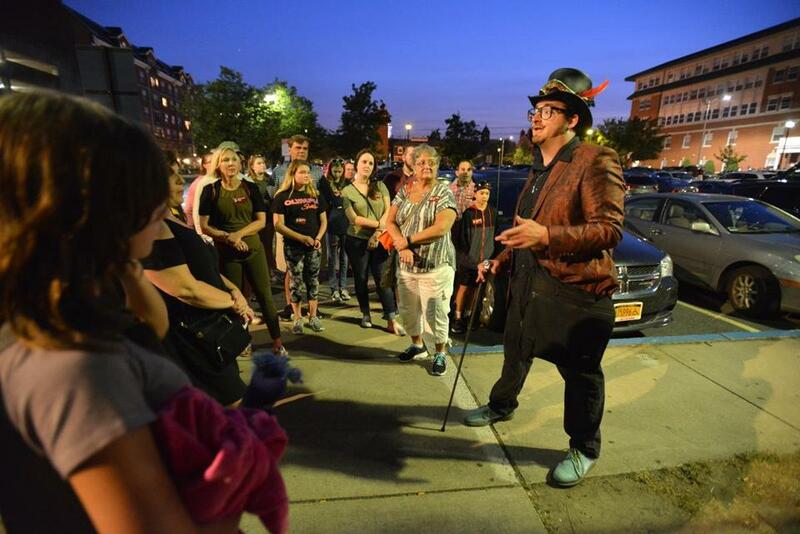 A glut of witch-kitsch outfits have since sprung up to capitalize on the city’s macabre history, providing tours and memorabilia to legions of tourists. The tourist hub is on Essex Street, which is lined with gift shops, each with its own iteration of witchcraft and the occult. The store Freaky Elegant sells merchandise related to the pointed-hat variety of witch, but I’m partial to a shirt emblazoned with a flaming skull and the non sequitur “I like to party.” Spooky. But the night doesn’t really get weird until I meet Dr. Mike Vitka, our guide for the night. 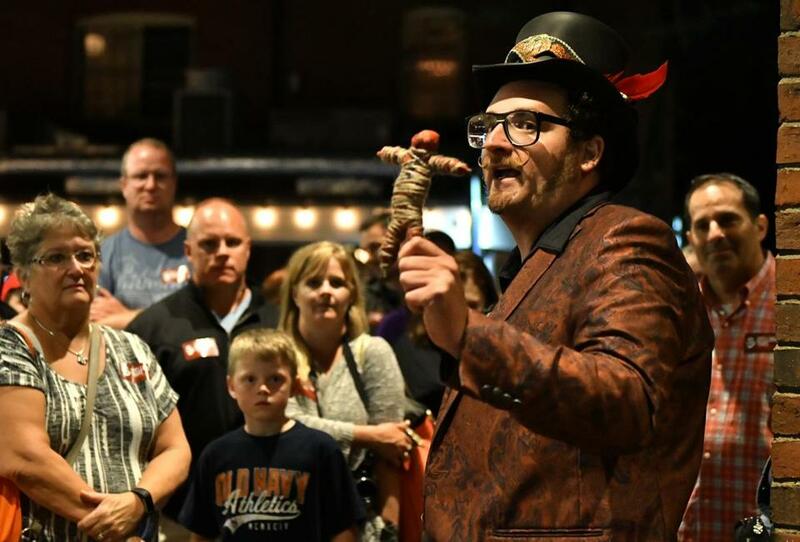 Sporting a woven top hat, a brass-colored paisley blazer, and a skull bolo tie, Vitka boasts a gravity-defying mustache and long sideburns, creating the impression of a somewhat subdued steampunk-voodoo priest. “If it wasn’t for the supernatural, I wouldn’t be here in Salem,” Vitka said. Vitka cut his teeth on the circus tour, he told me, where his job was to advertise the freak show. That experience is surely where he honed his gift for witty banter, which manages (mostly) to avoid hokiness. The tour hinges on Vitka’s likability, and judging from the tips he collected at the end of the night, customers walk away happy. Dr. Michael Vitka, who identified himself as a historian and paranormal investigator, stopped on the spot where 1691 witch hysteria victim Giles Corey was pressed to death. One of Vitka’s most endearing talents is his ability to combine the eldritch and the everyday in the same breath. At the former house of accused witch Bridget Bishop, now a seafood restaurant, he tells us matter of factly that several of the eatery’s glasses once levitated and that their clam chowder is very good. He’s been giving tours for 15 years, he said, because he loves telling the city’s history. He also investigates ghosts and the supernatural, and said a personal encounter with a spirit turned him from skeptic to believer. Which brings me to a crucial point about this tour: While it provides a great deal of historic context and information, it also dwells on the occult. But even skeptical parents who were dragged onto the tour by their wide-eyed children said they would recommend it, impressed with Vitka’s charisma and encyclopedic knowledge of the city’s history. There are 35 people on the tour, a mix of families, young couples, and friends. August is Salem’s second busiest month, behind October, Vitka says. 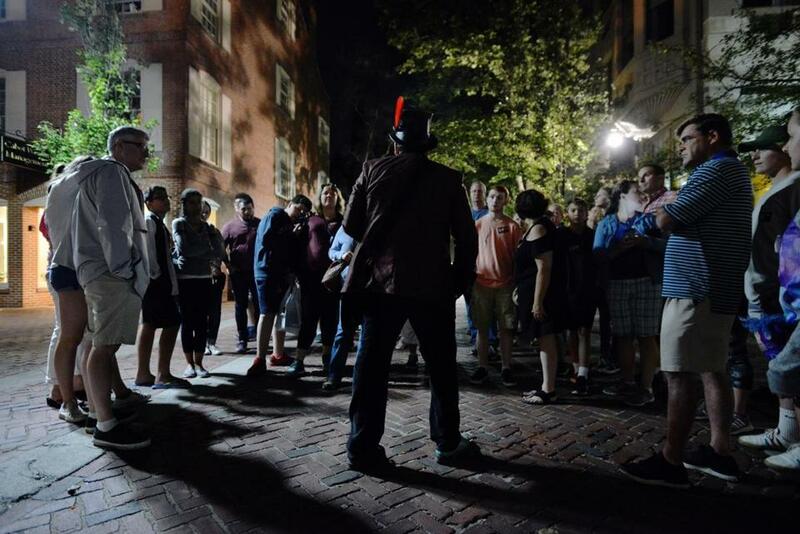 The tour takes us to a series of historic locations from the Old Salem Jail, where Giles Corey was pressed to death under the weight of heavy stones, to the location of a murder by the Boston Strangler, to Burying Point Cemetery, the nation’s second-oldest graveyard. Vitka encourages us to take photos with flash to help capture any signs of spirits: orbs, apparitions, or ectoplasm. About half of our group snap away for the rest of the night, and one woman whips out a ghost radio app. Justin, 11, who is visiting from New York, is one of the excited photographers. “Is this an orb or is this my finger?” Justin, 11, asks Vitka. Vitka breaks the news to him. “That’s your finger,” he says. Justin rated the tour as “beyond five stars” and said it was pretty convincing. The scariest tales Vitka tells are from the witch trials. He describes how paranoia overtook the city, how innocent people were targeted with false allegations and brutally killed. In some cases, the victims’ dogs were hanged alongside them. Some shake their head in agreement. Moments like that, Vitka said, is why the tours are important. 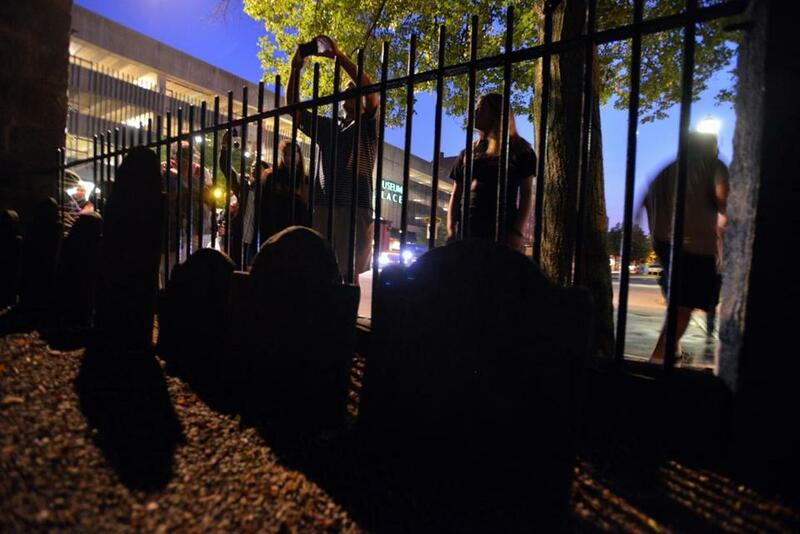 Tourists photographed a church graveyard in an attempt to catch ghostly apparitions. 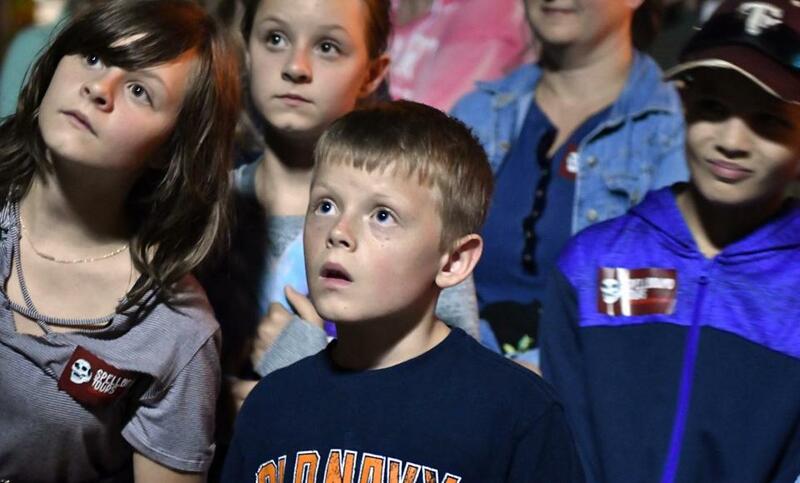 Devin Pilbeam, 8, of Ridgetown, Ontario, listened to a ghost story while on a tour lead by Dr. Michael Vitka. Catie Edmondson can be reached at catie.edmondson@globe.com. Follow her on Twitter @CatieEdmondson.